Twice in one week I was asked how I balance band saw wheels so I thought I would write something up on the subject. Balancing of the wheels is important on all band saws but it is essential on larger and higher speed saws. I have tried several other methods and none were completely satisfactory. This method is what I have settled on. It works very well, is easy, is done with the wheels on the saw, and doesn’t cost much. 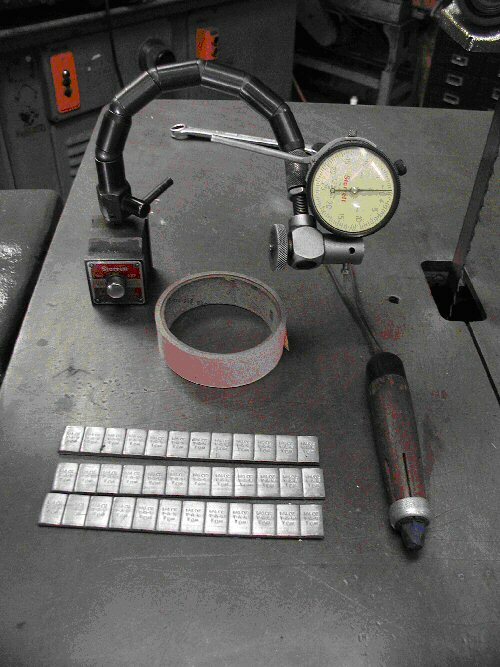 The tools needed are a dial indicator with a magnetic base, self sticking lead wheel weights (1/4 ounce), some good adhesive tape, and a lumber marker (photo 1). Be sure you start with a band saw that has good crowned tires before balancing. Any time you change tires or re-crown them you will need to re-balance as well. I started out needing a way to measure vibration. The low tech method I settled on is to set up a dial indicator with the base set upon a surface that does not vibrate much and the point of the indicator set on part of the band saw that does vibrate. In this case I had a disc sander table handy that was high enough to get the pointer up to the table (photo 2). In other cases I have put the magnetic base on the band saws table with the indicator set against the guide post. Both of these methods have worked well. Start balancing with the lower wheel only so remove the blade. 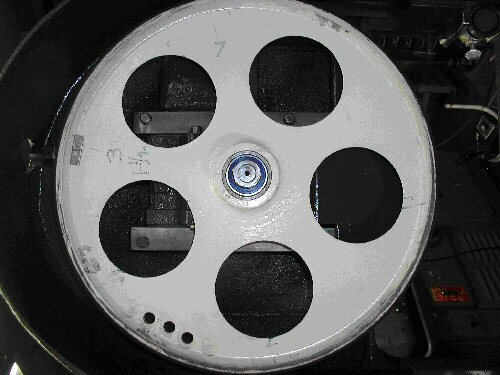 Pick a random spot on the circumference of the wheel near the edge and tape on one of the 1/4 oz wheel weights. Make sure the weight is secure, it is best to have it at the edge near the lip to help hold it in place (Photo 3). Turn the saw on. The dial indicator will register a quick fluctuation of a few thousandths of an inch. Note how many thousandths this fluctuation is, turn the saw off and let it come to a stop. I mark the spot on the wheel and the thousandths vibration with a lumber crayon (Photo 3). Remove the weight and move it along the wheel circumference approximately 90 degrees. Start up the saw again and mark the vibration at this point. 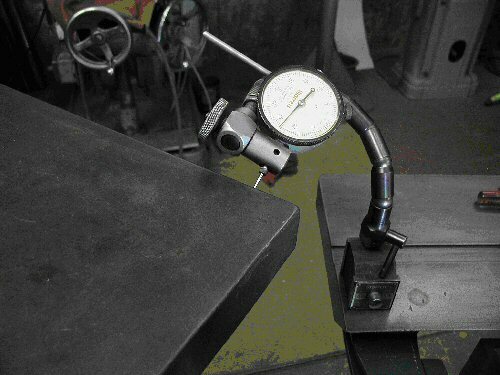 Continue working around the wheel until you have four measurements all roughly 90 degrees from each other (Photo 4). 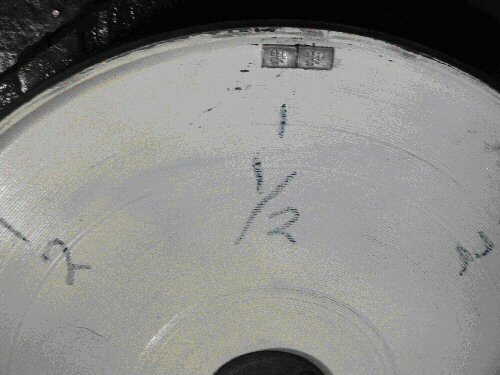 You should have a pattern of lower vibration to higher vibration as the weight moved around the wheel (Photo 4). In this case I had 0.004, 0.005, 0.002, and 0.002 as I went around the wheel. Since I had two spots where I had 0.002 thousandths of vibration I put the weight between them and started the saw. This time the indicator registered only 0.001. Now I know that this is the light side of the wheel that needs weight but I’m still not sure how much weight is needed so I try an additional 1/4 ounce. 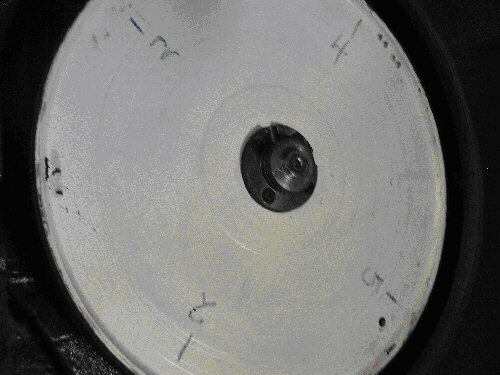 This time the vibration is only 1/2 of a thousandth or 0.0005 (Photo 5). Just to see if I can do better I add a third weight. This time the indicator measure is back up to 0.002 so obviously 2 of the 1/4 oz weights is best. I then remove the backing from the adhesive back on the weights and attach them securely in place and am done with the lower wheel (Photo 6). Now that the bottom wheel is done I can put the band back on the saw and do the top wheel using the same method. 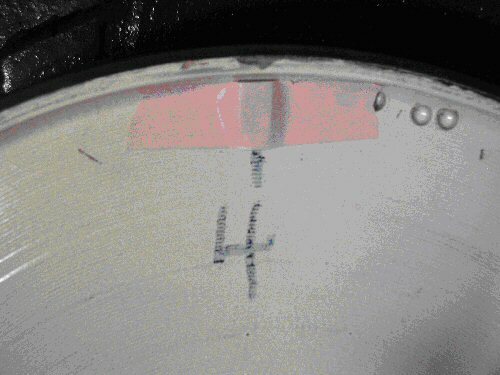 The upper wheel had vibration measured at 0.007, 0.011, 0.007, and 0.004. Since the lowest vibration was 0.004 I tried the weight at points in between on each side of the 0.004 point. On the left it measured 0.005 and on the right it was 0.003 so I knew that the point where the with the lowest vibration was the spot where the weight needed to be added. I then tried a second weight and that brought the vibration down to 0.0015. 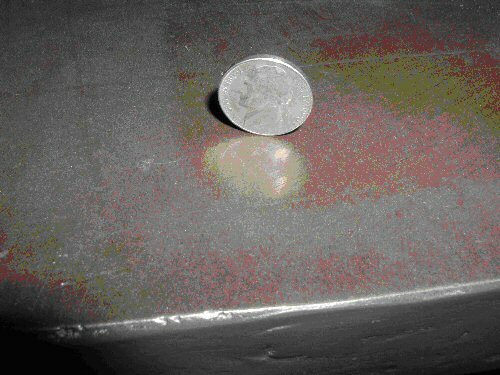 A third weight brought the vibration back up again so I knew that, as with the bottom wheel, I needed two 1/4 oz weights (Photo7).